My Father-in-law, a tall and stout man, often likes to dispense pearls of curious wisdom. Pearls that draw you in. Make you listen and concentrate with your head down. Usually over a pint, cupping your ear against the background din of a Friday night. And when he's said what he's had to say, Pete will often just lean back with a satisfied grin, full of sage ambivalence, finish his bitter and go and get another round in. Leaving you standing there, bemused and perplexed, wondering, "Did he just say what I think he just said?" One pearl that Pete often likes to trot out, is this gem. "Never trust a chippy with a full set of fingers. Same goes for butchers too." It's a twisted logic but the train of thought goes along the lines that any craftsman, in this case, a carpenter or a butcher, who loses a digit whilst plying their trade is actually going to be more skillful and thorough. Because having paid the ultimate sacrifice, you can be sure that the care and attention that they put into their work, is going to be of a far higher standard. Far higher than your average Joe, who would probably prefer to keep their phalanges intact in the first place. Which does makes sense. Albeit in a very macabre, perverse way. And having visited Donald Russell, master butchers and purveyors of fine foods, up in Aberbeenshire recently with May from Slow Food Kitchen, it was Pete's mantra that kept coming back to me, time and time again. The fairly full-on day started calmly enough with tea and biscuits and a historical overview of a family business which rose from the ashes of the BSE crisis in 1996. 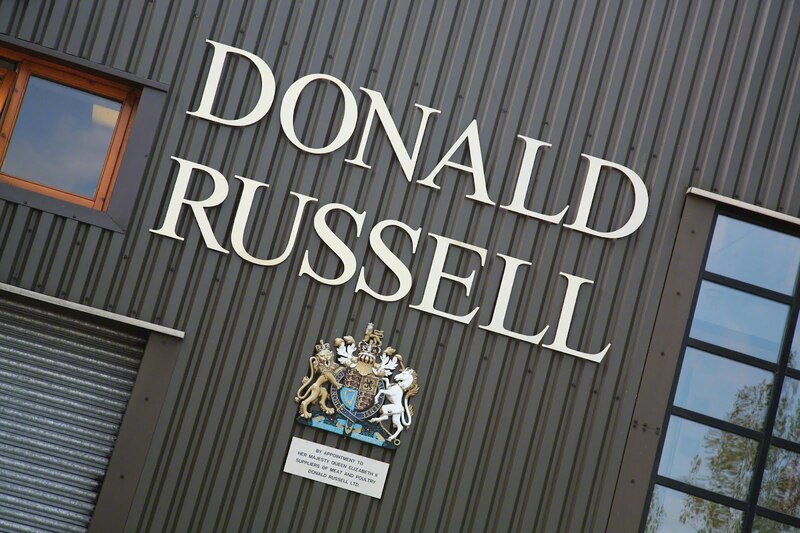 In a nutshell, prior to this cataclysmic event for British beef farming, Donald Russell supplied to trade only, providing gourmet meats to hotels and restaurants throughout the UK and worldwide. But once the news hit, the shutters came smashing down and a lot of jobs were lost. Fortunately, for Donald Russell, a small ray of light came in the form of an idea, to sell to the public and to "send samples out, not price lists." This, in turn, bolstered consumer confidence back into beef and the business entered a whole new era, providing steak by mail. Now little success stories like that do fill me with joy but having had a peek at their website (which reveals a lot about the ambition and drive of the company, they now sell a hell of lot of products), I did have some reservations. Personally, the Amazon led culture of buying online, especially food doesn't really appeal. Call me a caveman if you like (and my wife often does) but if possible, I would always prefer to see, smell, prod and if allowed, taste food when I am buying it. Clicking a mouse button seems too anonymous, too automated and after donning my Beastie Boy attire in readiness for our tour of Donald Russell's butchery departments and production lines, I wasn't too sure what to expect. But once I got used to the cold, I was pleasantly surprised. The first thing I noticed was the sheer number of bodies, not cadavers of cows, though there were plenty of those. No, the amount of people employed there was pretty startling. Butchers french trimming lamb racks, blades slashing back and forth. 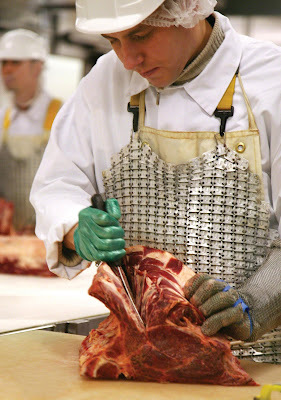 Steaks and cheeks were sliced with speed and efficiency, portioned and weighed, all by hand. Rows of pastry were lined with seasoned sausage meat, rolled and egged and cut, again by hand. I feel naive saying this but I had half-expected a whizzing, conveyor belt system attended by a dozen Johnny Number 5's. And the butchery that was on display was dazzling. Leaning in for a closer look at one guy who in a manner of seconds, was making deft work at reducing a joint of ribeye into 5 or 6 equal steaks, I couldn't resist the urge for a quick count up. "One, two, three, four.....hmm, he's still got all his fingers," I thought to myself. Perhaps a bit too loudly because 'Piotr' suddenly paused to stop and stare back whilst clenching his scimitar, reminding me in an instant that some butchers still have the capacity to scare the hell out of me. But gratefully, he just tipped me a wink and a smile before carrying on with his business. After that the rest of the tour went by fairly uneventfully although our foray into the maturation room did cause some brief alarm. Eyeing rows and rows of aging beef, darkened, encrusted and smelling faintly of cheese sparked off some serious tummy rumblings. I have already alluded to the Neanderthal inside me but the ongoing display of meat was beginning to fray and feverishly, I started to wonder if taking a little nibble, just a little bite, would be out of the question. Luckily Liz, one of our guides, then announced that it was time for lunch so off we sped to their development kitchen with yours truly, dragging his knuckles behind. Lunch was to consist largely of steak (naturally) but chef, Eddie McDonald had a couple of tricks up his sleeve to show us first, demonstrating that not all steaks are the same. Now I come from the school of thought where you should simply "wipe it's arse and stick it on a plate" and have gladly issued such instructions forth to yawning waiters in the past but Eddie had other ideas. The first curious suggestion was, that to cook a rump steak rare, you should allow 4 minutes for each side with a further 8 minutes or so for resting. Now I am all for the resting time but surely frying a steak for 8 minutes is sacrilege? But when Eddie brought out the pave rump steaks, which were as thick a er......a butcher's neck, I saw his point and with our help, we cooked three beauties to rare, medium and well done. As this was the first time I tried pave rump (think rump really pared down and trimmed of any fat) my first impressions was that the texture was nice but the flavour was missing somewhat. And of course, the well done steak was a pointless exercise because who in hell likes well done steak, done to shoe leather. The protein overload didn't end there though because in the oven Eddie had secreted three other types of steak for us to try. Actually secreted is the wrong word because the joints of ribeye, sirloin and fillet were enormous and the electric temperature probes that were inserted into each one kept beeping off at inopportune moments. Moving even further away from the wham, bam, thank you ma'am style of cooking steak, Eddie had kept these joints in the oven for over 90 minutes at a constant temperature of 60c. They had been seared off first but the method employed here ensured the most tender, succulent steaks possible with the least amount of effort, which I imagine is very popular with the likes of Mrs Fortesque-Smythe of Royal Tunbridge Wells. And the steaks, which were quite rare, once carved and distributed, certainly did melt in the mouth. My favourite was the ribeye with an oozing, rich vein of fat running through. 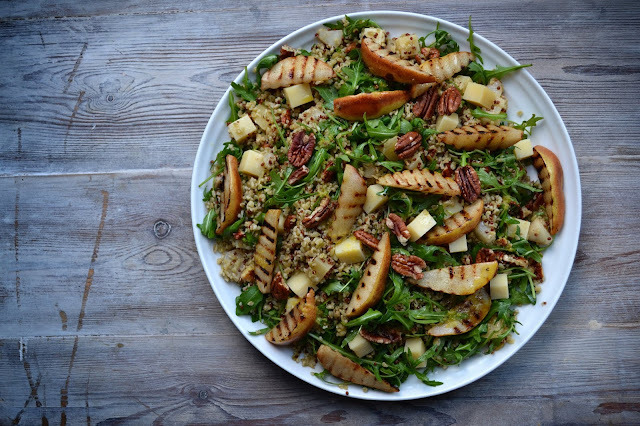 As lunch came to a close and somewhat stupified by a rush of amino acids, I clasped Eddie's hand and thanked him warmly for a fantastic lunch, noting that all his fingers were in place. Although perhaps I could have been a bit more casual about it as he did look a bit perplexed when I held his hand up to the light. And then it was then time to venture back into the tundra for our butchery Masterclass, the part of our visit that I was looking forward to most of all. Bequeathed with warmer gear ie a very trendy body warmer, we entered the demo room where upon the slab lay a rather alien looking object and given the temperature, we could have been forgiven for thinking that we had just wondered into a John Carpenter film. But what lay before us was known as a 'roasting', essentially a side of cow and for the remainder of the afternoon, the mission of Andy Grant, butcher and production manager, was to show us how to take it apart. As someone who professes a love for meat, I still get, somewhat embarrassingly, flumoxed at times when it comes to recognising what cuts come from where (I blame being brought up at the supermarket). So to have Andy break everything down simply and slowly was much appreciated. ....was trimmed down to this. And all that work for the most flavourless, in my opinion, piece of steak. No wonder it's so expensive. ......but then I hit gold. And it was like scoring a try at Twickenham. Although Andy did disparage my celebration of running high fives whilst holding a razor sharp knife because "That's how accidents happen Danny." And told me in no uncertain terms to put the blade down. But still, it was fun. So then the day came to a close and after a bit of a debrief, we retired quietly to our hotel (alright, there was a bit more steak tasting in the evening) and I do have to say that I thoroughly enjoyed my trip to Donald Russell. It was certainly an eye opener in some respects. Going back to my initial provisos about buying meat online, I would glady order from them in future. There are a couple of buts though. I think firstly, it would be encouraging to see Donald Russell embrace the artisan behind their trade and push it to the forefront because it was certainly evident. One of the many things we talked about on the trip was the fact that butchery is slowly becoming a dying trade in this country and Mark Farquhar, Head Butcher at Donald Russell, spoke of initiatives to support the industry such as apprenticeships, training schemes etc. If I could go to the website and see more of that happening then personally, it would be more of a draw to use them. Secondly, throughout the trip, the elephant in the room (rather than cow) was the issue of provenance. You might have noticed that I haven't mentioned the words 'Aberdeen Angus' once or any other breed. This is simply because it didn't really come up. I am sure that they do source Aberdeen Angus from local farms for meat but it wasn't really pushed. In fact, one curious statement went along the lines that it "wasn't about breeds but about quality." Which for a company such as Donald Russell, complete with royal appointment, sounded strange to me. Something almost that my Father-in-law would come out with. Surely customers want to know where their meat is coming from? No? I know I do. It may well be an obtuse and contrary thing to focus on, right at the end, after all I have no understanding of the company's operational level but if Donald Russell were to unravel this last cloak of anonymity, then I for one would be caught, hook, line and sinker. And by the mouth please, not by my fingers. Many thanks goes to Donald Russell and Wild Card for their hospitality and for organising the trip. Brilliant, Dan - the perfect post to put up on the day they tell us to stop eating red meat. Screw 'em! We used to get lots of stuff from Donald Russell and it genuinely was all absolutely fantastic - probably my introduction to what high quality meat was really like. However, no, living in such close proximity to gems like the Ginger Pig and the East London Steak Company, it's hard to justify purchasing stuff from so far away (not to speak of the frozenness and slightly excessive packaging). Those pave rump steaks take a lot of beating, though, and the enormous legs of lamb that we've had in the past were really amazing. The Day Out looked pretty awesome too! All their meat is Irish, I believe. I know they got into trouble a few years ago as they were selling it as Scottish and it wasn't. Catherine - Yeah! Screw 'em! Miss Whiplash - Oooh you snob you but I suppose that the market is very competitive now, hence the expansion into other areas. Leisa - Thanks, it really was an enjoyable day. JoJo - In fairness to Donald Russell, I should have pressed them some more about their sourcing before finishing the post to balance things up. It's great that they run the business on the principle of delivering quality meat, why not highlight the provenance too? Would certainly round the picture off. Provenance and consistency are my issues with DR. I've had some steaks from them that have been delicious, but some that haven't, and their burgers were very disappointing. And I simply don't like the way they present themselves as Scottish but source their meat far more widely. There is no information on the meat one is sent about which country, let alone farm or breed. I just don't like that level of obscurity, when I can get meat, online or otherwise, with far more information. Kavey - I am not so sure that by defining themselves as a Scottish butchers, all their produce has to come from Scotland. No more than my butcher in Essex should source everything from the county. No Donald Russell are primarily in the business of producing gourmet meats and that's fine by me. But as you say, provenance is important and if they were to embrace it, say to couple their products with information about the farms, breeds, personalised stories etc etc then that would certainly make Donald Russell more attractive to buy from. Interesting post. I used to by meat from them from time to time when we lived in the UK and was consistently impressed by the ribeye. I agree with your suggestions at the end (i.e. pushing the artisan butcher badge more prominently and also being more transparent about where these animals are coming from). I share the concerns about provenance especially now that DR has been bought over by Vestey. The thread that I posted my concerns on has now been removed as far as I can see so maybe your blog item will disappear also! I have mostly enjoyed my purchases from Donald Russell, have had great customer service but as a previous commenter said - they are not transparent about the source of their meat when other online butchers are. I can go to the premium butcher in my home town and will be told where the meat is from.At over £15 each for a DR lamb rack - my favourite - I deserve to know where the lamb was raised.